Jesus wants us to enter discipleship with our eyes wide open. He splashes water on the face of the overzealous one; he startles awake the one who is stuck in the past; and today he drives home the point about our need for intentionality when we choose to follow him. Read on…. Someone who knows about farming told me the way to make the best use of your farmland and to use every possible acre to grow your desired crop was to make your rows straight and square. He said the way to do this was to start on one end of your field, pick a spot on the opposite end and then keep staring at that spot as you start moving toward it with your plough or your tractor. Keep your eye fixed on the one spot, because if you get distracted and look away, you will end up with a crooked row. My rows remained relatively straight as I went to wedding after wedding, watched my girlfriends get married and start families. These women were still my friends, but they were busy with their new lifestyle and there wasn’t a lot of room for a single. So I made new friends and watched them marry. Same story unfolded. It was getting harder and harder to make new friends. That’s when he came along. Handsome, fun, came from a great family, and was attracted to me. My rows began to go a little crooked. It began innocently enough, I agreed to go out with him so I could “share the Lord with him.” One date led to the next and within three months I told God to screw it. I had always wanted an intimate relationship with a man, God had never given me one, so I would get it on my own. Sure, he wasn’t a believer, and in my gut I knew I was settling for less than I truly wanted, but at least he was real, I could talk to him and hug him. So, take that God! Ah but God wasn’t willing to let me go so easily. The very weekend I told my boyfriend about my decision to let our relationship move to the next level of intimacy, I found him in the corner of the bar where we had gone with friends making out with another woman! My row had a big crooked curve in it now. It took years for me to process my anger toward God. The humiliating and confusing experience I had when I found my boyfriend in that compromising position has been redeemed by God’s grace. In retrospect, I feel God was spreading a net to catch me as I attempted spiritual suicide. And I am grateful for the rescue. The farmer’s straight rows and God’s dramatic intervention in my romantic life demonstrate how serious Jesus is about intentional discipleship. We need to fix our eyes on Jesus, the source and goal of our faith. Keep moving toward him, do not be distracted from our destination and our end. If we get distracted, or look back, we will lose our way, get off track. Our rows will be crooked and our harvest less plentiful. It is God’s gift to us, we receive and learn to live it, trusting God’s faithfulness, his forgiveness, his love and his power to teach us well. Jesus invites us to follow him and we respond. Here’s a look at one type of response. This guy is so enthusiastic about following Jesus. He’s ready to give follower-ship all he’s got. He’s eager, quick and ready to make a promise and a commitment. Jesus, though, requires a realistic assessment of self and of one’s words. The young, the naive, the quick or emotional words of commitment and promise need to be awakened to what will be required in this relationship. It will not be easy, enthusiasm will not soften the rock you will have as your pillow. Jesus wants us to be open-eyed about the cost of this discipleship. How many hearts are broken because an emotional promise was made that could not be kept once the fire of attraction died down? Working as a youth ministries intern at my church is how I supported myself in college. My slightly older co-worker Mark and his wife Charlotte took a liking to me and invited me into their circle of affection. They were cool and they chose me. I felt pretty cool. One day they announced to me, rather casually I thought, that they had decided to love me unconditionally and then began to pour words of affirmation upon me. After this announcement, they would seek me out, their only objective was to tell me they loved me. This should make me happy, right? But it didn’t, instead It freaked me out. I felt smothered by their attention and began to withdraw. Where I used to be warm and receptive, I was now cool and elusive. I wasn’t purposefully pouring water on the flame of their love, I was just wounded and not able to handle such loving demonstrations. Not surprisingly, their love cooled. In retrospect, I give them a huge break, they were probably 24 years old, very good intended and very human. But when they let my reactions to their movements toward me modify the way they acted toward me, I became more convinced of the false truth I feared; I was not worthy of love. Their eager but faltering attempt to love as Christ loved, solidified my self-hatred. What if they would have just loved me? I certainly am not without fault. After months of praying for the faltering marriage of a friend, I remembered Jesus’ explanation to his disciples that sometimes a situation needed more just just prayer, it needed prayer combined with fasting to be effective. So I earnestly promised my friend I would fast and pray for the healing of his marriage. Well, I didn’t. As Jesus said, “the spirit is willing but the flesh is weak.” Their marriage ended. And I felt slightly responsible about its demise. Peter was one of those quick to declare guys. After the last supper, he promised he would follow Jesus wherever Jesus went, even lay down his life for him. Jesus knew him so well, Jesus knew Peter wouldn’t keep his promise. Jesus told him the truth about his fickle nature (Peter would deny Jesus three times before breakfast); and yet loved him to the end and beyond. We need to own our desire and our lack; let our hearts be moved with zeal to follow Jesus and yet be acquainted with our inability to do it well. Jesus will not be surprised by our shortcomings. He prays for us and welcomes our attempts. When we fail, we fall, and with each failure, let us fall into the arms of God’s grace and begin again, wiser and more humbly. Let the hot flame of love burn low, so its embers can sustain the heat necessary for warmth and provision. Next time another possible response to Jesus’ invitation to follow him. See you then! Every person will express his or her God given identity in a way that is unique to them, but these three names form the essential truth about our identity. Growing into this identity is the “stuff” of our life of discipleship. Who are you? You are God’s beloved child, in whom God delights. Enough. Yet, within you, a voice that will not be silenced whispers, “there must be more.” It questions the status quo, it suggests the hope of a return to a dynamic, enjoyable spiritual life. But how, you wonder? Can what is old and familiar be made new and interesting? Can new life enter dead habits? Yes and no. Or maybe I should say no and yes. 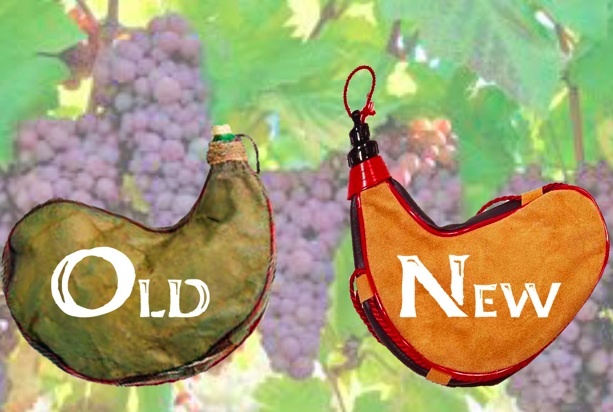 and Yes…Jesus again, “Don’t pour new wine into an old wineskin.” You are the new wine, created to ferment and expand, you need a new wineskin. Old wineskins are the answers that satisfied us as new believers, knowledge gained and disciplines practiced that defined and informed our spiritual understanding. They held us as we grew, but now they constrict our continued growth. We still need a wineskin to contain our process, that doesn’t change. What changes is our relationship to the wineskin. We are bored and stunted in our spiritual life, because we have the answers. We know how to pray, we know the importance of a quiet time and corporate worship. There is no mystery left to discover. Old wineskins are made of answers; new wineskins consist of questions. The NEW Old is not intended to be an information-filled, answer-packed series of posts. It is an exploration of some important questions, questions of great significance. Here’s what we will do, we will take our important questions and address them, not to ourselves or to each other, but to God. And in this process we will allow God to address us with a few questions of God’s own. Please come along, let’s ferment together! The Lord plans to live an amazing life through you, a life that accomplishes and realizes feats of faith and wonder that will astonish even yourself. “We must work the works of him who sent me.” (John 9:4). “We” – a partnership, you and Jesus together. You are invited, in fact, you are necessary to the plan of God. Since Jesus was physically present to creation for only a brief moment in history, the Trinity needs you to bring the spirit and presence of Jesus to creation now, during your brief moment of history. In Luke 9 Jesus called twelve of his closest friends together and gave them power and authority over demons and disease. He then sent them out into the world to practice what they had witnessed him doing and now had the power and authority to do themselves…proclaiming the Kingdom of God and healing those who needed a cure. The Trinity has a plan. It is to send Jesus’ closest friends out into the world with the good news. The nature of your intimate relationship with and trust in Jesus makes you one of his closest friends. And the nature of God’s intimate knowledge and trust of you makes you one of the ones with whom Jesus shares his power and authority. This amazing life of yours begins with Jesus’ call of you and his desire to share his life with you. “He went up the mountain and called to him those whom he wanted, and they came to him.” (Mark 3:13) Jesus called the ones he wanted. His life and his voice filled the air with an invitation to come to him and live. He desired for all to heed his call and come to him. This invitation has not ceased. Yet, not everyone who hears his voice comes to him; but you, Elle, you came. 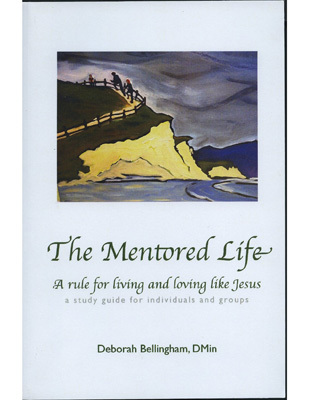 Your heart, longing for significance, recognized the call of love in Jesus’ invitation. You are one he wants. He chose you, you responded. He initiates, you follow. There is such a mutuality in this choosing. Both sides of this interaction are significant. 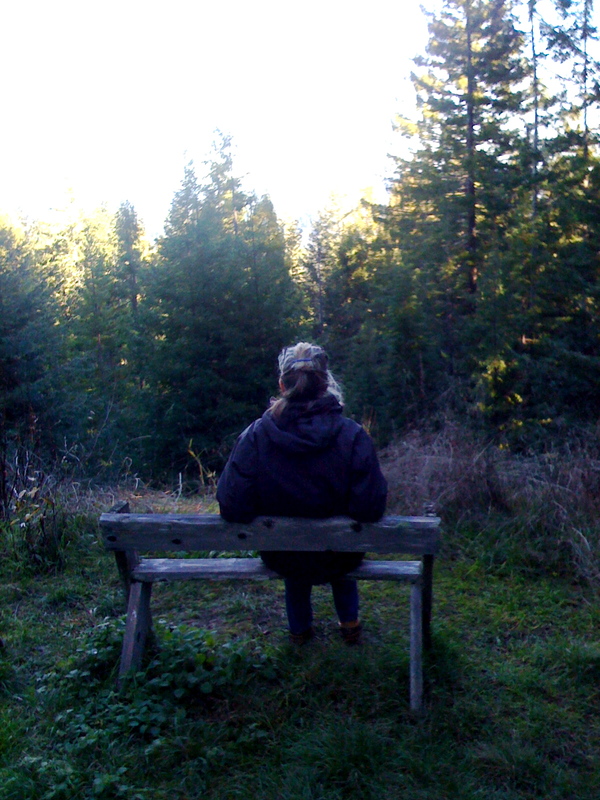 You’ve climbed the mountain of obedience and now sit with Jesus, awaiting his voice. What drives you to Jesus? He begged for more than alms, he begged for mercy. In both yesterday and today’s Gospel reading Jesus asks, “What do you want me to do for you?” Yesterday’s request by James and John was born of ignorance mixed with pride, today’s of hope for restoration and maybe a little anger. Bartimaeus wasn’t always blind. Something transpired in his life that robbed him of his sight. His blindness physically reduced him to the role of an insignificant beggar, yet his spirit retained the memory and the experience of being a person of consequence. 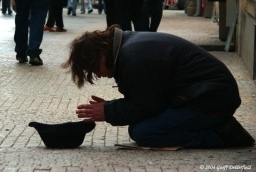 In Jesus, he hoped for more than alms because of who he was, a blind beggar. He hoped for mercy. Please consider subscribing to my blog by returning to the upper right corner of the page and entering your email address. Thanks. 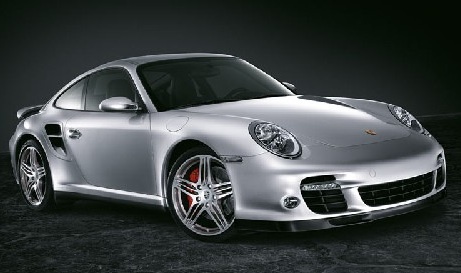 Jesus, Porsches and discipleship? Connected? How? How are Jesus, Porsches and discipleship connected? Here’s how. You walk with Jesus, get to know him and trust him; watch him do wonders, listen to his authoritative teaching, even witness God’s power working through you. Then there comes a day when you approach Jesus with your heart’s desire. First of all, I love the approachability of Jesus. He was patient and generous with these two friends, who had no qualms about coming to him with a pretty selfish request. They must have known they would be welcome. This is where the maturing begins, trusting Jesus enough to come to him as you are, daring to ask for what you really desire. You don’t have to pretty it up, or pretend you don’t want it. “God desires truth in the inward heart.” (Ps 51). You must be real and raw. If you want a porsche, tell God about it. Start where you are. Go to Jesus with your heart in your hand. Enter the conversation. Key word: conversation; complete with give and take, speaking and listening. Don’t demand and then shut your ears. This is God’s entry point into your heart. In telling God what you really want, you invite God to talk with you about the contents of your heart. Remember Jesus said, “Where your treasure is there will your heart be.” God uses this conversation to shed light on the true nature of your soul. Back to Mark, “But Jesus said to them, ‘You do not know what you are asking.’” Jesus’ gentle reminder that they are limited in their vision, their power and their understanding. They think they know what would be best for them, but they hold only one little part of the story. They cannot comprehend the big picture, which is about so much more than their small wants and desires. By the leading of the Holy Spirit we now realistically examine our motives, and without judgement, realize our sin-tainted values and intentions. Oh, dear friend, this is the purifying and necessary path to a mature faith. Not using God to get what we want, rather, wanting God to get what we need. And what do we need? Power to follow Jesus where ever he leads. “(James and John) replied, ‘We are able.’ Mark 10:39. Jesus affirmed their ability to follow him where ever that might lead, he did not give them a porsche. Porsches will rust and decay, relationship with Jesus will increase and remain. Why not subscribe to my blog? Go to the top of the post and enter your email address. Thanks.